At the last AGM held in February, your new Committee was announced. There have been additions since then too – so please have a look and see who does which role. We wish to THANK ALL Brochure Advertisers for their support of Strictly at Naas LTC! Please take the time to watch our little video montage of all the advertisers…and please SUPPORT those who supported OUR CLUB! 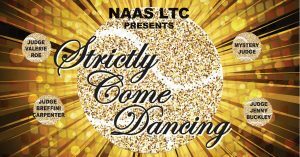 It is finally time to reveal the amount of monies that we managed to raise through Strictly @ NaasLTC! Firstly, I would like to thank all the dancers on the night – you were amazing and put on a brilliant show! You know who you are….but here are the pairings again for all those who missed it…..
And well done to the winners Tommy & Marguerite! So we were raising monies for the installation of two Padel Tennis Courts in Naas LTC and I think we have managed to put a right dent in it…so thank you to everyone who bought a ticket, sponsored a dancer, took a page advert in the Strictly Brochure, bought brochures, bought raffle tickets, test drove a Toyota – the list goes on doesn’t it? A most special mention to Paul & Helen Donnelly – the Lead Sponsors of the night – it would not have been possible without you and all the other sponsors. Nearly there….keep reading…..special thanks to all the volunteers that made the occasion so unique – this ranges from the Strictly Committee to the teens selling brochures and raffle tickets on the night – well done to all! I thank you on behalf of our club! We will also be donating €2 per ticket sold to Aoibheann’s Pink Tie charity – and since we sold nearly 950 tickets, we thought it would only be fair to round the amount up to €2000! Just to let you know that the draw and schedule for the January Doubles 2019 is now live. Please make sure to play your matches by the play by dates. The Executive Committee wish all members of the club a happy and joyous holiday season. Beginners: This coaching is suitable for beginners or members who presently play green ball and wish to progress to the next level. Email: membership@naasltc.net or call Theresa on 045-866035 Monday – Thursday 9.30am to 1.30pm.